The UK government is now targeting critics of the fake chemical attack in Salisbury it has attributed to the Russians with zero evidence. Most recent example, Dr. Chris Busby, a British retired nuclear scientist. His home in Bideford, Devon was raided after cops responding to a domestic argument reported feeling sick after visiting the residence. Later, it was reported, these supposedly stricken officers felt fine. Busby was arrested and detained under the explosives act. I believe the “concern for a woman’s safety” and the reportedly sickened cops are phony as the Skripal poisoning itself. Dr. Busby was targeted for his criticism of the government response to the Skripal affair. He has also criticized the United States for using depleted uranium. Busby was raided, arrested, and his home sealed off not because he posed a threat to a woman—or because the authorities claim there is a dangerous lab in the home—but because he has appeared on RT and elsewhere expressing a belief the Skripal affair is a false flag. Dr Busby is used as an “expert” by the Kremlin-backed RT channel – formerly Russia Today – which today broadcast a staggering interview with suspected Salisbury hitmen Alexander Petrov and Ruslan Boshirov. 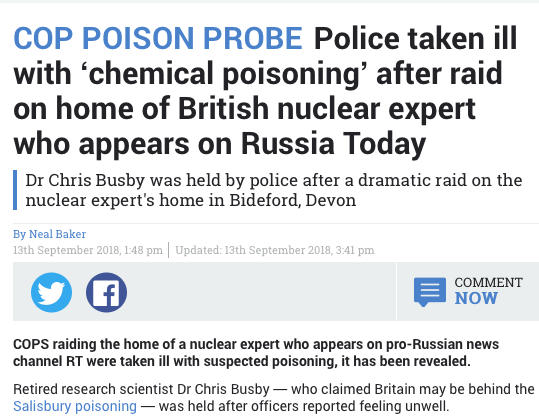 The website headline reads: “COP POISON PROBE Police taken ill with ‘chemical poisoning’ after raid on home of British nuclear expert who appears on Russia Today.” The Independent ran a similar headline. Obviously, this raid was planned well beforehand, and the alleged argument was nothing more than an excuse to get inside the home and frame Busby—not for posing a risk to the public, or building explosives, but because he criticized the government, not on Facebook or his own website, but on RT, which is licensed by the Russian government and is falsely and absurdly accused of working with Vladimir Putin to flip an election in the United States. The raid and arrest send a strong message: criticism of the state, especially in regard to the Skripals, will not be tolerated.